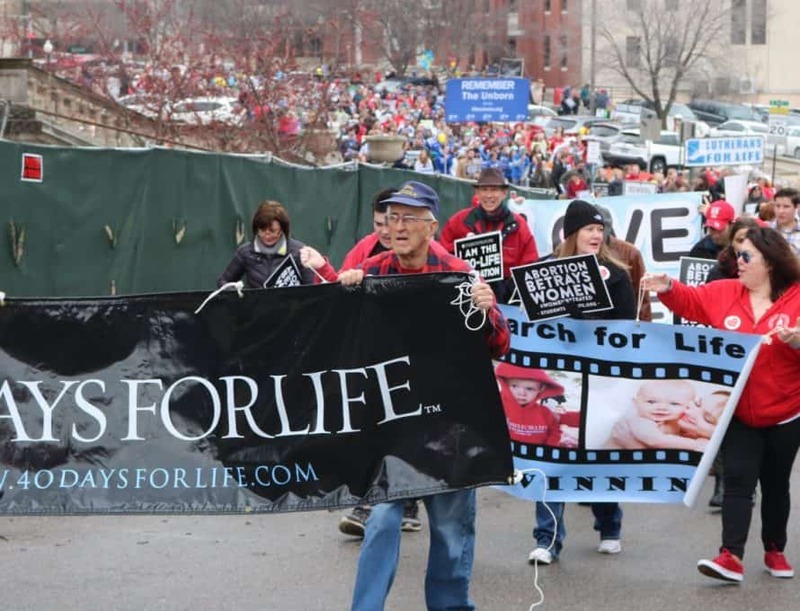 JEFFERSON CITY – Fog and chilly temperatures didn’t dampen spirits of hundreds of men, women and children who gathered in Missouri’s capital Feb. 2 to defend the lives of the unborn. Students Abolishing Abortion in this Lifetime.” After a pre-march rally and exhibits across the street from Missouri’s capitol building, the coalition marched around the building and met in the Capitol Rotunda. Though pro-life advocates have made progress in Missouri in recent years, watchdogs say vigilance is key this legislative session. Susan Klein, the executive director of Missouri Right to Life – one of the endorsing partners of the March for Life – and a member of Cedar Grove Baptist Church, Holts Summit, said her organization’s legislative priority is to is the “Pain-Capable Unborn Child Protection Act.” This legislation will prevent abortions on babies that can feel pain during an abortion. This legislation extends general protection to unborn babies who are at least 20 weeks beyond fertilization (which is equivalent to 22 weeks of pregnancy — about the start of the sixth month). “There is abundant evidence that by this point in development (and probably earlier), the unborn child has the capacity to experience excruciating pain during typical abortion procedures,” Klein said. While there are always challenges and legal hurdles to be overcome when it comes to fighting abortion, Klein said she remains optimistic of the Pain-Capable Unborn Child Protection Act’s chances. Continued funding for pro-life programs like the Alternatives-to-Abortion program, Show-Me Healthy Babies, and funding for pregnant women to get off drugs while pregnant. Klein also noted that in 2018 and continuing into this year, Missouri is seeing the life-saving effects of SB 5 from 2017. That law expanded regulations on abortion in multiple statutes, and improved the tracking of baby body parts from abortion to prevent the buying and selling of those parts for research. It also expanded the powers of the Attorney General and protects Pregnancy Resource Centers and faith communities in St. Louis and across the State of Missouri from being forced to participate in abortion. Abortion clinics have closed and the pro-life laws from SB 5 are still preventing abortions. “There are upcoming court challenges to these laws, and we need to pray that these laws will stay in effect for the protection of women and their babies!” Klein said.